The incretin hormones glucagon-like peptide-1 and glucose-dependent insulinotropic peptide are secreted by enteroendocrine cells and augment glucose-induced insulin secretion in response to food ingestion in a glucose-dependent manner. This mechanism forms the basis for incretin-based therapies in type 2 diabetes. However, the insulinotropic effect of incretins is diminished in type 2 diabetic patients, due in part to reduced expression of incretin receptors as a consequence of glucotoxicity. In this issue of Diabetologia, Kang et al (DOI: 10.1007/s00125-012-2776-x) provide evidence that in addition to glucotoxicity, lipotoxicity also affects incretin receptor expression and signalling in insulin-secreting cells and isolated islets. 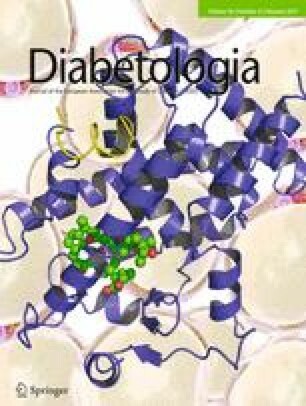 In animal models of diabetes, the authors show that co-administration of a lipid-lowering drug with a dipeptidyl peptidase-4 inhibitor or a glucagon-like peptide-1 agonist improved glucose tolerance and beta cell mass. These novel findings provide convincing support for the notion that restoring normal circulating lipid levels in type 2 diabetes might help improve the efficacy of incretin-based therapies. The incretin hormones glucagon-like peptide-1 (GLP-1) and glucose-dependent insulinotropic peptide (GIP) are secreted by enteroendocrine cells and augment insulin secretion in response to food ingestion in a glucose-dependent manner. Incretin-based therapies for type 2 diabetes include inhibitors of the enzyme dipeptidyl peptidase-4 and GLP-1 agonists. In type 2 diabetes the insulinotropic effect of GIP, and to a lesser extent of GLP-1, is diminished . This has been attributed in part to reduced expression of their receptors as a consequence of glucotoxicity , a possibility supported by the observation that normalisation of blood glucose levels in patients with type 2 diabetes restores the efficacy of GLP-1 and GIP . In this issue of Diabetologia, Kang et al  provide evidence that in addition to glucotoxicity, lipotoxicity also affects incretin receptor expression and signalling (Fig. 1). The authors show that prolonged exposure of insulin-secreting cells and isolated mouse islets to elevated levels of the fatty acid palmitate leads to decreased Glp1r expression, impaired incretin potentiation of glucose-stimulated insulin secretion and diminished GLP-1 signalling . Expression of both Glp1r and Gipr was diminished in islets from db/db mice and was restored by the lipid-lowering drug bezafibrate. Combined administration of bezafibrate and the dipeptidyl peptidase-4 inhibitor des-fluoro-sitagliptin improved glucose tolerance, islet architecture and beta cell mass in db/db mice, whereas either compound alone had no effect. Chronic co-administration of bezafibrate with the GLP-1 analogue exendin-4, but not with the GIP receptor (GIPR) agonist [d-Ala2]GIP(1–30) (D-GIP), enhanced the glucose-lowering effect of exendin-4 in db/db mice, and this was associated with improved islet morphology and increased beta cell mass and proliferation. This study provides important information by demonstrating, both in vitro and in vivo in mice, that lipotoxicity alters incretin signalling via reductions in receptor levels. It corroborates, and provides a mechanistic basis for, the previous observations that obesity is associated with a reduced efficacy of incretin hormones in humans, independently of glucose tolerance . The expression of Glp1r and Gipr is decreased in islets from type 2 diabetic patients , suggesting that the mechanisms observed here in mice might also be operative in humans. Several questions arise from this study. First, while the effects of fatty acids in vitro and hyperlipidaemia in vivo were consistently observed at the level of Glp1r expression and signalling, the decrease in Gipr was not seen in vitro, and normalisation of circulating lipid levels did not improve the efficacy of D-GIP in db/db mice. Thus, it remains to be clarified whether lipotoxicity selectively affects GLP-1 signalling or also affects GIP. Second, glucotoxicity and lipotoxicity are known to synergistically impair beta cell function, a phenomenon referred to as glucolipotoxicity . Therefore, it would be interesting to test the combined effects of elevated glucose and fatty acids in this context. Third, although the beneficial effects of bezafibrate in db/db mice were associated with improvements in islet architecture and beta cell mass, whether normalisation of circulating lipid levels also improved incretin signalling in non-beta cells (for example, in the brain) was not directly examined. This limitation is, however, mitigated by the recent findings of Lamont et al  who, using transgenic overexpression of Glp1r in beta cells of Glp1r-null mice, clearly established the critical role of the beta cell GLP-1 receptor (GLP1R) in mediating the beneficial effects of GLP-1 on glucose homeostasis. The finding that lipotoxicity alters incretin receptor expression is reminiscent of the decrease in insulin gene expression observed under similar conditions. In the presence of elevated levels of glucose and fatty acids, insulin gene transcription inhibition is due, at least in part, to decreased expression and function of the transcription factors MafA and pancreatic duodenal homeobox-1 (PDX1) . Indirect evidence suggests that MafA and PDX1 could also be involved in the mechanisms examined in this study. First, MafA controls Glp1r expression . Second, PDX1 binds to the promoter region of the gene encoding the transcription factor TCF7L2 , and loss-of-function of TCF7L2 by RNA interference in human islets  or gene deletion in the mouse  results in a decrease in Glp1r expression, suggesting that PDX1 indirectly regulates Glp1r expression via TCF7L2. It is therefore possible that the loss of incretin receptor expression under lipotoxic conditions results, as is the case for the insulin gene, from defective MafA and/or PDX1 expression and function, although this possibility remains to be experimentally tested. In conclusion, the study by Kang et al  uncovers another facet of the functional impact of lipotoxicity in beta cell function and glucose homeostasis, by showing that, in addition to its detrimental effects on insulin secretion, it also impairs incretin signalling. The beneficial effects of lipid-lowering agents on the efficacy of incretin-based drugs need to be demonstrated in humans before conclusions can be drawn regarding the validity of this approach in type 2 diabetes, especially since the ability of GLP-1 agonists to stimulate beta cell proliferation, well documented in rodents , has yet to be shown in humans. If the benefits of this strategy were confirmed, it would clearly support the notion that reducing circulating lipid levels is an important aspect of type 2 diabetes therapy as it will enhance not only glucose-induced insulin secretion but also its potentiation by incretins. The author was responsible for the conception, design and drafting of the manuscript and approved the final version for publication.